On this date in 1941, the day the official “state of siege” was declared in the Soviet capi­tal of Mos­cow, Red Army forces from the Soviet Far East and Sibe­ria began arriving on the Rus­sian Front. Soviet dicta­tor Joseph Stalin was con­vinced that evac­u­ating most of his troops from the Soviet-Japa­nese bor­der repre­sented little risk owing to infor­ma­tion from a Tokyo-based spy, Richard Sorge. The Russian-born Sorge, whose cover was that of a Nazi reporter for the Ger­man news­paper Frank­furter Allge­meine among others, was the Soviet infor­mant who had cor­rectly pre­dicted the date of Ger­many’s inva­sion of the Soviet Union four months earlier (Opera­tion Barba­rossa) and the Japa­nese attack on Pearl Harbor. (Stalin stub­bornly refused to believe reports from Sorge and other sources fore­telling the approx­i­mate date of Adolf Hitler’s attack on the Soviet Union, pos­sibly because he be­lieved them to be a ploy to dis­rupt the Ger­man-Soviet non-ag­gres­sion pact of August 1939, the Mo­lo­tov-Rib­ben­trop Pact.) Code-named “Ram­say,” Sorge (1895–1944) was one of the best Soviet intel­li­gence offi­cers of World War II, and he con­tinued to feed Mos­cow in­for­ma­tion from his base in Tokyo until arrested by the Japa­nese secret police (Kem­peitai, equi­va­lent to the Ger­man Gestapo) on Octo­ber 18, 1941. Until his con­fes­sion under torture, Sorge was assumed by the Japa­nese to be a Ger­man spy. (The Soviets did not of­fi­cially acknow­ledge Sorge was on their pay­roll until 1964.) 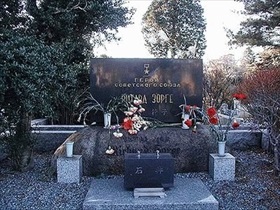 Sorge was hanged on Novem­ber 7, 1944, in Su­ga­mo Prison outside Tokyo. Sorge’s semi­nal role in the Battle of Moscow (Octo­ber 2, 1941 to Janu­ary 7, 1942) and per­haps in the Battle of Stalin­grad (Septem­ber 1942 to Febru­ary 1943), during which the Ger­mans suffered stra­tegic defeats on their east­ern front, is today memo­ri­alized in a road­side monu­ment between Mos­cow’s Shere­met­yevo Inter­na­tional Air­port and the Kre­mlin, as well as in the east­ern Ger­man city of Dres­den, where the Com­mu­nist govern­ment of the former Ger­man Demo­cra­tic Repub­lic estab­lished a memo­rial gar­den in the Alt­stadt (Old City) in 1970. After the war Su­ga­mo Pri­son was the exe­cu­tion site of seven Japa­nese war crimi­nals sen­tenced to death by the Inter­na­tional Mili­tary Tri­bu­nal for the Far East, among them Gen. Hideki Tōjō, Japan’s prime minister during most of World War II (1941–1944). 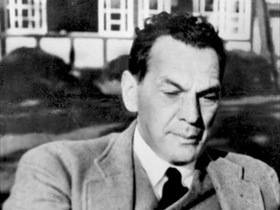 Left: Family photograph of Richard Sorge from 1940. 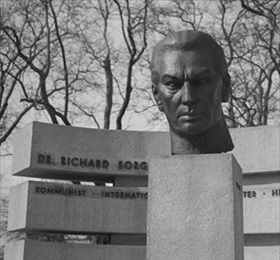 Sorge was born in 1895 near Baku, Azer­ba­ijan (then part of Russia), to a Ger­man mining engi­neer and a Russian mother. Back in Berlin where he grew up, Sorge served in the Ger­man army during World War I (he was severely wounded), earned a PhD in poli­tical science, and joined the Ger­man Com­mu­nist Party in 1919. His poli­tical views led him to leave Ger­many for the Soviet Union, where he became a junior agent for the Comin­tern, an inter­na­tional com­munist organi­za­tion, in Moscow. In 1929 Sorge was recruited by the head of Soviet mili­tary intel­li­gence and worked for that depart­ment for the rest of his life. In May 1933 the depart­ment asked Sorge to orga­nize a spy net­work in Japan, the same year Sorge “joined” the Nazi Party. Above: In 1970 the Communist government of East Germany accorded the half-German, half-Russian anti-fascist hero with an impres­sive memo­rial gar­den in Dresden. 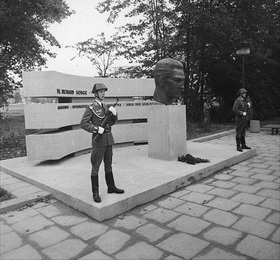 First in the list of attri­bu­tions under Sorge’s name (right photo) is the word “Kommunist.” Neither the memorial garden nor the adjacent street named after him exists any longer.